The international wine festival TOP VINO by eVino has this year, after a two-year pause from its first edition in 2016, returned to Cankarjev dom - Cultural and Congress Centre Ljubljana. After the first successful edition in 2016, the international wine festival TOP VINO by eVino returned on October 8th to Ljubljana and to its most prestigious event venue Cankarjev dom – Cultural and Congress Centre Ljubljana. 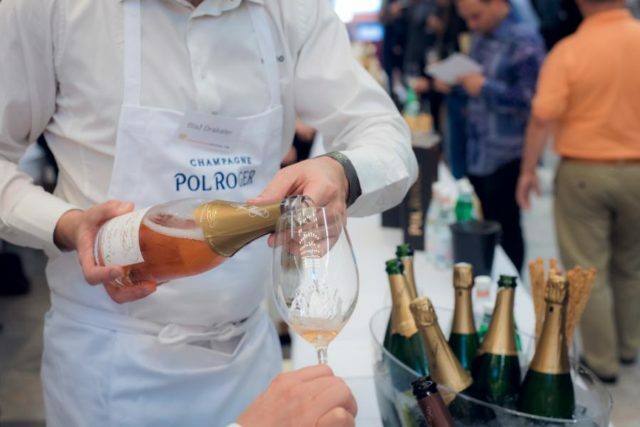 This year too it was possible to taste some of the most prestigious wines in the world; hence, it is a common agreement that the TOP VINO stands as the most prestigious wine festival in the region. The event provides for a rare opportunity of a so-called ‘portfolio tasting’ when wine lovers can for an accessible price taste wines they could have never tried otherwise. This year, the festival featured 28 Slovene winemakers and 54 foreign wine cellars. The rich wine offer was rounded off with trendy gins and tonics, with distills, gourmet offer, wine accessories, and coffee. Together, there were 100 exhibitors presented. TOP VINO was officially opened by the Chinese Ambassador Mr. Ye Hao. Among the wines, the visitors were able to taste Bordeaux chateaus, champagnes, wines from the best cellars in Tuscany, Spain, Portugal, Austria, California, New Zealand, Balkans alongside the 30 best Slovenian winemakers. The event was enriched with a novelty: workshops where the interested visitors were able to deepen their knowledge or learn something new. For example, Stefano Canello from Riedel held a workshop on Red Wine Veritas Riedel Glass Tasting, and Caroline Gilby from MW prepared a workshop titled Slovenian Decanter Awarded Wines. The organiser eVino decided for Cankarjev dom as a location pf the festival due to its prestigious location which is logistically very appropriate for festivals of this kind, said the owner of eVino Gašper Čarman at the press conference. In 2016, the festival welcomed one thousand visitors, and this year the organiser in collaboration with Cankarjev dom enlarged the festival’s floor with widening the Grand Reception Hall of the Cankarjev dom what opened an additional space and, thus, welcomed 1,200 wine lovers. Francija: Château Giscours, Château du Tertre, Château d’Yquem, Château Figeac, Château Smith Haut Lafitte, Château Pontet Canet, Château Capbern, Château Calon Segur, Château Lassegue, Château Le Pey, Champagne Pol Roger , Champagne Serge Mathieu, Vincent Girardin, Louis Max, Bailly Lapierre, La Chablisienne. Italy: Gravner, Trevisiol, Castello Banfi, Tenuta di Biserno, Sassicaia – Tenuta San Guido, Ornellaia, Zidarich, Keber. Spain: Torremilanos, Aalto, Ramon Bilbao, Vega Sicillia. Portugal: Casa Alexandre Relvas, Van Zellers, Esporao, Quinta do Vallado. New Zealand: Tenuta di Biserno. California: Kendall-Jackson, Mt.Brave, Stonestreet, Rockbare. Slovenia: Vina Gašper, Marjan Simčič, Posestvo Burja, Edi Simčič, Movia, Pasji Rep, Sutor, Ščurek, Dolfo, Jakončič, Guerila, Korenika & Moškon, Dobuje, Joannes, Steyer, Istenič, Blažič, Šturm, Šumenjak, Klet Brda, Vinska klet Metlika, Čarga, Dora Erzelj, Frešer, Puklavec Family Wines, Vina Oskar.